Having recently graduated from a highly-esteemed western Pennsylvania institution of higher learning, I have spent much of the past week reflecting upon my four years of undergraduate education. Was it financially worth it? Did I pick the correct majors? Why on Earth did I take that class on European Monetary Policy and purchase so many Tesco meal deals while abroad? And perhaps most importantly, have my studies adequately prepared for a successful career as a professional football player? 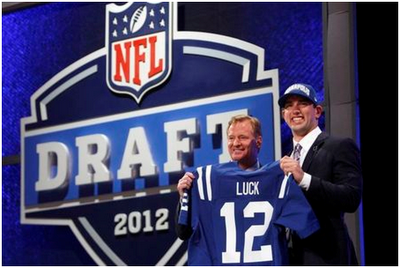 As you may have been aware, the NFL recently held the 77th instance of its collegiate draft. 250 players were selected in total, and all of them had ostensibly been previously enrolled at a four-year American or Canadian university (Fun Fact: Eric Swann was actually selected sixth overall in 1991 by the Cardinals while playing for a semi-pro team in Massachusetts after one season at Wake Technical Community College). As is usually the case, pundits, fans, and NFL personnel evaluators are keenly interested in determining which picks will succeed at the professional level. Traditionally, these individuals have relied on game film, the silly circus that is the NFL Combine with its misapplied 40-yard dash and other similarly useless events, and interviews and other various psychological exercises to evaluate college prospects. Even with these tools, many teams still haven't got the whole "drafting well" thing down pat, considering that Blaine Gabbert went in the top ten last year and a large number of first-rounders fade into obscurity and/or staggering mediocrity after a few seasons. Perhaps teams would benefit from looking at one of the more overlooked characteristics when evaluating NFL talent: a prospect's college major. While not practicing, lifting weights, or amassing cars and other ill-gotten benefits from boosters, college players are required to complete a certain number of credit hours of classes per NCAA regulations. This activity generally involves declaring a major at some point. I am conducting this study in order to determine whether a player’s undergraduate major has any effects on their performance at the professional level. I think there are three plausible theories regarding NFL success with respect to a player’s major. 1. The Swahili Hypothesis: This idea basically states that majors don't have any independent effects on a prospect's NFL success because all college football players take the same classes at a particular school. Certain colleges offer non-rigorous majors where they sequester a significant amount of their athletes, such as Community and Family Studies at the University of Texas and the General Studies program at the University of Michigan. If this holds, comparing draft picks by major is essentially the same as comparing players by the school they attended. 2. The Easiness Hypothesis: Alternatively, players with easier majors could perform better in the pros than those athletes whose academic tracks require them to put in long hours balancing chemical equations and understanding abstruse arcana such as the writings of Wittgenstein and the Mundell-Fleming model (obviously the latter reference is made in jest). Since most schools don't offer courses in stalk blocking or covering the flat, coursework may possibly serve as a distraction that prevents prospects from developing their skills to perform in the NFL, and thus those athletes with less-demanding majors that don't ask for large time investments are likely to be more successful in the pros. As this chart demonstrates, there is a pretty considerable range of profitability on the college major spectrum. If the profitability hypothesis holds, college majors in the lower two quadrants of bankability will be more successful in the NFL. The general notion behind this is that prospects with more lucrative majors have a steady fallback option if their pro careers don't work out, which may have a negative effect on their performance and effort levels. Meanwhile, players with majors in less useful fields have an added incentive to play well and last long in the NFL because their academic backgrounds don't really qualify them for any useful jobs. If the easiness hypothesis holds, meanwhile, we would see that NFL success is greater among players with easier majors regardless of their economic returns. I will use data from the 2004 through 2012 drafts. The study will focus on first round draft picks selected over the period. Thanks to the New England Patriots’ espionage shenanigans and associated penalties, a total of 287 college players were selected in the first round in the years studied. To the great relief of my more statistically-inclined reader(s), I am leaving Stata on the backburner for this post. I created the dataset in Excel and computed everything by calculator. I collected the data primarily from school web sites, many of which host player profiles for quite a long time, and some archival research from scholarly journals. Despite what Dominique Foxworth may claim, I think the Pro Bowl is rather uninteresting and a large waste of time and strongly advocate for the reestablishment Bert Bell Benefit Bowl in its stead. Its flaws notwithstanding, the Pro Bowl does provide lazy pseudo-academic bloggers a somewhat decent metric for evaluating player performance. Thus, I will define a "success" in the NFL as a prospect that was invited to the Pro Bowl at some point in their professional career. Yes, this is binary and does not give bonuses for players with multiple appearances, but like I said at the beginning of the post, I just received an undergraduate degree in economics from a public college, not a PhD in statistics from MIT or something. I will also withhold draft picks from 2011 and 2012 when calculating each major's success rate. Analysts seem to have gradually accepted the notion that players sometimes take a few years to develop, and they now constantly boast that they are too enlightened to even deign to evaluate drafts at their immediate conclusion and thus refuse to give draft grades. Unfortunately, this does not prevent the same pundits and idiot bloggers from completely writing off players after weak rookie seasons (a la Blaine Gabbert) or jumping to ridiculous conclusions after the first week of regular season play. Von Miller and other Pro Bowler rookies from 2011 are included in the success calculations, however. I completely realize that many college athletes don't come all that close to finishing their degree, but given the NFL's eligibility requirements most have at least three years of college enrollment and it wouldn't be that hard for them to finish their degree at a later date, especially since they probably wont have to spend as much time practicing and procuring ill-gotten gains from boosters once their playing days are over. This is pretty interesting by itself, but it doesn't completely test the profitability hypothesis. In order to do that, we provide a more thorough breakdown of these results and group together majors by their profitability. The above figure does support the idea that easier majors appear to have higher success rates than harder ones, however. We should now analyze the less bankable majors and look at their success rates. This ranges from the difficult majors to the easier yet still profitable academic tracks such as economics and finance. 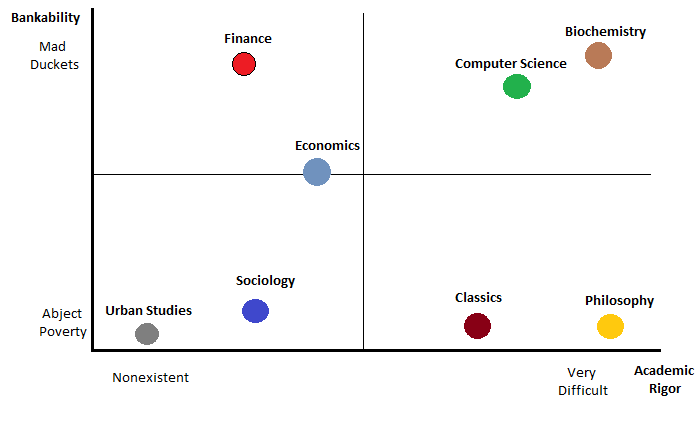 The graph is sorted by academic rigor. To defend my fellow Econ majors now playing in the NFL, I will say that former CoSIDA Academic All-American of the Year Alex Smith wasn't that bad last season. These findings lend some credibility to the idea that players with majors that yield higher-paying jobs may be less successful in the NFL. This holds for difficult majors such as Engineering as well as the less difficult fields of Economics and Finance. Now we should determine whether players with less bankable majors demonstrate higher levels of NFL success as the profitability hypothesis suggests. This graph consists of more difficult and less useful majors and is sorted by academic rigor. Not the biggest vote of confidence for the profitability hypothesis. I included STEM in the graph to determine whether the easier useless majors led to more NFL success, which appears to be the case. Now we must compare these results to a sample of less-respected colleges with weaker academic reputations. I collected these schools by working backwards from the U.S. News ratings to cover all the schools rated from 125th to unranked in their ratings. The schools are listed in backwards order of ranking. The overall success percentage isn't very different from those prospects that went to more competitive schools. 35% of first rounders in the less competitive sample make the Pro Bowl compared to 31% of those attending top 50 institutions. Thus, it appears that the academic reputation associated with a prospect's school does not have a significant effect on their NFL performance, though the direction of the results is consistent with the profitability hypothesis. It is also worth noting that when the vast majority of players at top-tier institutions such as the University of Michigan are majoring in fields such as General Studies the mind-numbing simplicity of their coursework is probably counteracting any positive benefits deriving from the fact they went to a respected school. The Redskins were foolish to pick Robert Griffin III and Kirk Cousins, not because it creates unwelcome competition or prevented the team from addressing other pressing needs but because the NFL track records of Political Science (RG3) and Kinesiology (Cousins) majors are particularly poor, with none offering a Pro Bowler from the first round. Political Science has been the worst performing major since 2004 and includes the likes of Brady Quinn within its ranks. It appears that Criminology is the best major for college football players, as it has the highest success rate for majors with over five first rounders and boasts Pro Bowlers such as Patrick Willis and Jason Babin. The only colossal bust who majored in the field was Erasmus James, who was a Sociology major as well. These results suggest that the easiness hypothesis has defeated its profitability cousin. Most successes in the NFL are highly concentrated within a few majors which stretch across the profitability spectrum. These are mostly linked by the fact that they are all relatively easy compared to other potential academic tracks. There is some support for the Swahili hypothesis, as several schools exhibited considerable levels of scholarly homogeneity. Chad Faulcon, recent signing of the Atlanta Falcons (congratulations and best of luck) will make the team's final roster and knock Oakland's Darren McFadden out for the season when he inadvertently sneezes in the general direction of the rather fragile running back during warmups before their week 6 meeting. I was going to make a joke tangentially relating these conclusions to the current state of international capital markets but the Money and Investing section of today’s Journal looks extraordinarily unappetizing. If any former LSE classmates desperate for dry and jargon-ridden financial prose have made it this far, I am referring to the May 3rd New York edition. The article analyzing France’s potential policy impacts on the European Central Bank looks especially unappetizing. The dataset I created for this post can be found here.